It must be very, very cold outside. 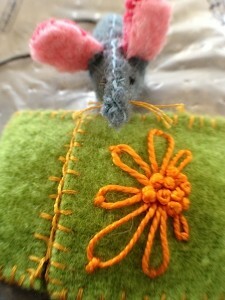 There’s a mouse called Albert taken up residence the Chapel Gallery! Not only that, he’s brought his very own sleeping bag with him. Fancy that. Here he is having a quick peek. It must be warmer in the gallery than outside… he’s stuck his head out for a good sniff. Seems I’m friendly enough… he’s out and about. He is bold for such a teeny tiny mouse. Interestingly it has been very cold in Wensleydale this last few weeks and it’s still trying to snow a little bit more despite the sunshine showing it’s face today. I’m not so surprised that Albert came to stay. What did surprise me was word must have gotten out…. as Albert’s friend has come to stay too! 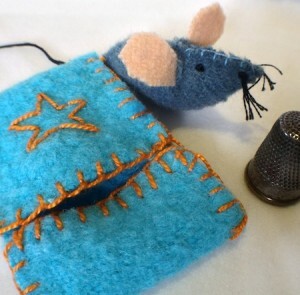 I think Albert said he could come and stay a few days because his friend brought his sleeping bag with him too! 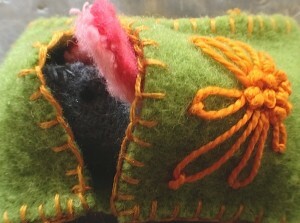 I really do have to be careful not to lose sight of these mice. 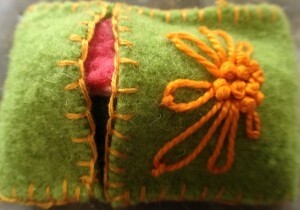 They are very small, perfect for little hands and little pockets. Albert’s friend says his owner is little Joshy who lives in the West Country and is only four years old. He says Joshy takes him everywhere tucked in his pocket and he gets to go on lots of adventures to school, the dentist, doctors, friends, out to lunch at fancy restaurants and even to the park. By the look on Albert’s face he’d like an owner like Joshy. Hey he’d even be happy to live in a mum’s purse or pocket just to be brought out to be played with by any little person when they’re bored or need distracting. 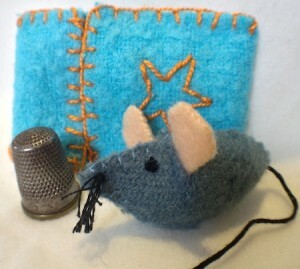 As it is Albert is the Official Chapel Gallery Mouse and is a VIM (a Very Important Mouse) with civic duties and the like. 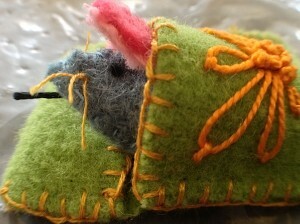 He’s been busy and it is ‘back to bed for another snooze-time’ it seems. 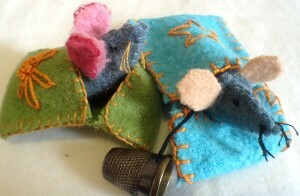 More of Albert’s friends are available from the Chapel Gallery, Hawes. Look out for DIY ‘Albert-look-a-like’ Kits coming soon. Hello! I just would like to give a huge thumbs up for the terrific info you’ve got here on this post. I will be coming back to your blog for far more soon. Hello Praphesotte, thank you very much for such a lovely comment. 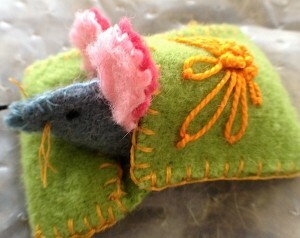 I’m pleased to say the Chapel Gallery Mouse (and his comfy bed) are now available as a kit from here.